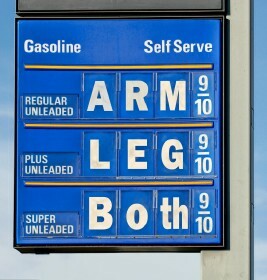 It's Spring time folks and gasoline prices are at the highest levels for the year. Another couple of months until June then it will be back down. Conserving Fuel is a Great Idea! Remember gas was consistently under 50 cents a litre in 1999 ! by train or carpool when possible. Work and Buy stuff over the Internet. Use your car only when absolutely necessary. Public transportation authorities often have carpooling information as well as transit services. Walk and bicycle where you do not have to carry loads or travel excessive distances. If you own more than one vehicle, drive the one that gets the best gas mileage whenever possible. SUV's use gas like there is no tomorrow! Carpool to work with people who work in the same workplace or close to the same workplace. Find a ride: To work, to school, to the hockey game, soccer game etc. Offer a ride: Fill up those empty seats in your vehicle. For normal usage budget, set an amount for weekly gas. Do not go above that amount. If the price rises, only pay the same amount as you normally budget for. If it drops, only pay the same amount. This way you will be motivated to save gas. Another way to handle the high cost of fuel is to buy less dollars at each pump. Do not fill up or even pay out your weekly fuel allowance when the price is too high, as this triggers fuel companies to perceive that the consumer is willing to pay high pump prices. You might have to spend your weekly allowance for fuel in several different pumping stations over the week. This signals fuel companies who see cash flow loss that the price they have put at the pumps to be too high. Gas companies seem to like to quickly raise the prices on Thursday and Friday and slowly lower them on Sunday and Monday.. To counteract this if you have to travel on the weekend - fill up your tank on either Wednesday or Thursday before they raise the prices. Combine errands into one trip. Consolidate trips to destinations that are near one another. Sit down and examining how many regular car trips you make in a week. Make a list of things that need to be done using your car. Most of these things can be saved to do on only one day of the week. (shopping, banking, hair care, etc.) By careful consolidation car trip planning you should be able to decrease the number of trips by one-half. Most people use a vehicle on a weekly basis just to do their banking and go shopping. Consider doing your shopping and banking on the Internet. When shopping for an item - do your research on the Internet. Buy on-line. If you want to buy locally, call ahead to see if the item is available - then make only one shopping stop for that item. Will high gas prices stimulate on-line shopping? Will high gas prices stimulate buying locally produced products like locally-grown food? Once you arrive, park in a convenient location if possible and walk between destinations. Save errands for one afternoon and plan your trip so you don't retrace your route. You not only save gas this way, but reduce wear-and-tear on your car. If you are fortunate to live close to the US/Canadian border, then you have the opportunity to purchase gasoline at less than you would pay for it in Eastern Ontario. For instance, on June 2, 2014 the Eastern Ontario price for a litre of gas was about $1.38 and in Ogensburg, Alexandria Bay and Massena the price for a gallon of gasoline was $3.64. Taking into the cost of a bridge toll both ways and the exchange rate the saving for a purchase of 30 litres is about $8.60 Cdn. Use ethanol enhanced fuel. This fuel contains a percentage of ethanol which does not harm today's modern car engines. Buying this fuel in effect reduces slightly the need for oil based gasoline and besides it burns cleaner and does not pollute the environment as much as ordinary gasoline. Although using ethanol enhanced fuel slightly lowers your miles per gallon usage, it does lower the need for petroleum based fuels, increasing the supply and providing impact to lower the overall price of gasoline. If you go on vacation and want to travel long distances, consider renting a car that has better gas mileage than the one you usually drive. If you can rent from a rental agent that provides per day rental at unlimited mileage it might be more attractive that driving your the personal gas guzzler. Besides most cars that you rent have mileages less than 30,000 km and are in fairly good shape and should get good gas mileage. Try to go on vacations on bus trips. It is a great way to meet new people who have similar interests. And there is no hassle looking for parking at your destination. If you work in an industry or service whereby the work that you provide can be provided by telecommuting then ask your boss if this is possible. Saving even one or two days out of five depending up how far you usually commute will save lots of gas, money and time over one year. Telecommuting or working from home is the growing trend. With the advent of company chat rooms, even conferencing or meetings are possible without using gas. What can I do to save money when buying gas? Shop around for the best gas price. There are now lots of Internet sites that will tell you where to find the lowest gas prices in a particular city. Gas prices are set mainly from the wholesale price of gasoline. The barrel head price of oil is one indicator of the rise or fall of prices in four weeks time, but if you want to know if the prices will rise in two weeks - check the current wholesale price. As a rule of thumb - prices of 2.51 cents US/gallon are high and usually will cause prices to be $1.00 plus cents/litre. Prices lower than 2.25 cents/ US gallon will reflect a pump price to be less than 95 cents in about 2 weeks. When the pump prices are uncomfortably high do not fill up your tank but with only a set amount of money like $10.00 or $15.00. 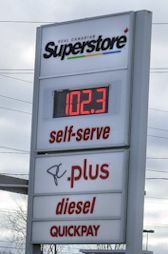 Shop around, when individual gas stations find gross revenues are being reduced, they have a tendency to lower the price per litre. Avoid long idles. Turn off the engine if you anticipate a lengthy wait of over 3 minutes like when waiting at a train crossing for a train to pass. It is cheaper to stop the engine and restart it if the wait time is longer that 1 minute. Instead of idling at a drive-up window, park the car and go in. Idling burns more gas than restarting the engine. Limit car warm ups in winter. Don't carry unneeded items in the trunk. 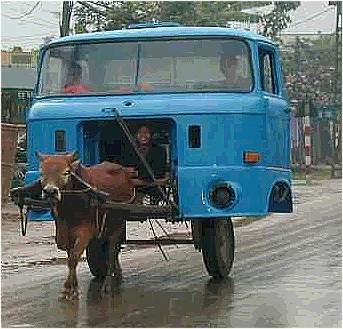 Extra weight decreases gas mileage. Also, reduce drag by placing items inside the car or trunk rather than on roof racks. In cold weather check the oil level in your engine. Cold weather starting does not allow the car engine to heat up quickly enough to seal the engine parts. Thus more oil is used. When a car has less than the desirable amount of oil lubricating the moving parts, it uses more energy (gasoline) to move the parts and thus you use more gas. Avoid high speeds. You can improve your gas mileage about 15 percent by driving at 100 km rather than 120 km. Use your air conditioning only when necessary. Roll down the windows or open the air vents to keep your car comfortable on those not-so-hot days when traveling at city speeds. Get regular engine tune ups and car maintenance checks. Tune ups improve performance as well as gas mileage. Check your owner's manual for recommended maintenance schedules. By following the manufacturer's recommendations, you should avoid fuel economy problems due to worn spark plugs, dragging brakes, low transmission fluid, or the transmission not going into high gear. Use the cruise control on your car to maintain a constant speed if you have to commute to and from work on a highway. If you have to commute over a long distance, you will be pleasantly surprised how much gas you can save by using the cruise control to maintain a speed just less than the speed limit allowed. Keep windows closed when traveling at highway speeds. Open windows cause air drag, reducing your mileage by 10%. In general, the lowest octane in your area delivers the best mileage. In general, playing with octane is best left to an expert or automotive engineer. Look 2 intersections ahead, adjust speed to avoid stopping for red lights and traffic. When you stop, especially quickly, you are losing major energy momentum. This is obviously more difficult during rush hour and emergencies. Use hills to advantage, let the vehicle accelerate going down a hill so momentum and coasting will help take you up the next. Take the roof rack off - If you�re not using your roof rack then remove it. They affect the aerodynamic efficiency of your vehicle and create drag, reducing fuel economy by as much as 5%. On curves, slow down prior to the curve, and accelerate slowly when half way through - both are safer and more are a little easier on the gas consumption. Every time you hit the brake, or just ride the brake - you are wasting gas. Do whatever you can to adjust driving habits to avoid braking whenever possible. If you are driving along a high speed highway where there are lots of large trucks - stay behind one keeping up the same speed as the truck to "draft". The truck breaks the air and you drive without air resistance saving lots of gas. Use Nitro found at Scuba Diving Stations to fill your tires to about 35 psi. Nitro fill allows me to run a higher PSI in the tires and it doesn't expand and contract like regular air. It's used in Nascar tires so they don't get hot and explode. Another benefit, I don't have to add air as often. Nitro is a bigger molecule than regular air so it doesn't escape as easily. Wax your car so that a can of soda easily slides down the hood or trunk. This is a sign that air is passing over your car with little resistance. Reducing the air flow friction can over long trips reduce the amount of gas used. What should I consider when buying a new car? Understand your needs and buy accordingly. Get only the options you really need. Optional equipment that adds weight to your car can decrease your gas mileage (especially heavy options such as four-wheel drive). Automatic transmissions generally degrade fuel economy. Larger engines and higher horsepower typically result in lower gas mileage. If you need the additional power and torque, be aware your gas mileage will suffer during all types of driving. Check the gas mileage ratings of similar vehicles. Buy a fuel efficient model in the size category that meets your needs. The Federal Gas Mileage Guide, issued annually and free of charge at all auto dealerships, compares gas mileage of similar models. http://en.autos.sympatico.msn.ca/finance/Fuel_bill_estimator.aspx - Fuel Bill Estimator to estimate how much it will cost you annually for gas for your car. Ethanol - A clean cocktail for your car? Do you know that driving with your headlights on actually can increase your gas consumption? Why is the fuel economy of an automobile worse in the winter than in the summer? Do want to know the cost to fill your tank for a 600-mile run to Grandma's house? Check out the Gas Price Calculator at ABCNews.com's travel section ( http://abcnews.go.com/sections/travel/ ). Using figures supplied by AAA's Fuel Gauge Report, this handy tool spits out an estimated cost based on mileage, type of vehicle and area of the USA. One caveat: Because the site is not updated frequently, gas prices could be out of date. e-mail: Cliff.Thornton@cognos.com phone: (613) 738-1338 ext 5607 fax (613) 738-2706 for some of the suggestions for this page. Purchase narrower tires with the same overall diameter. April of 2008 I replaced my worn out tires with tire LT215/85R16 and upgraded my exhaust to a single, high-flow exhaust (a larger pipe and muffler post-catalytic converter versus a dual exhaust which is the common upgrade). My actual fuel mileage is now 20-21 mpg. Overall diameter of new tire is less than 3% larger than OEM tire and similar weight therefore within specification and no noticeable affect on speedometer or odometer or braking. Many newer vehicles have wide low-profile tires for tight handling and nice appearance. The average driver will never use the full capability of these tires and as a result are paying more by lower fuel economy and higher prices at tire replacement time. Many light-duty truck drivers have alternative sizes available to them however most dealers simply recommend the OEM size, it is an easy sale. However with better fuel economy and better handling while towing I fell many drivers would choose the alternate.
" I agree with much of what you said about gas consumption however, it seems to me that the only way to really reflect the TRUE COST of gas (which necessarily includes the environmental cost), is to have it reflected in the price. Though the government may not be fair in its pricing/taxing, it is the only way to reflect the true cost. Compared to the rest of the world, we have 'enjoyed' relatively low gas prices... nevertheless, we complain complain complain without a thought to the ramifications beyond price! "Another way to save quite a bit of gas , is to keep your car cleaned and waxed . As the wax will reduce air drag on the car, and allow the car to slice through the air more smoothly. Another way is to improve the air intake to the engine by using better air filters, such as K&N air filters which allow more air to the intake."